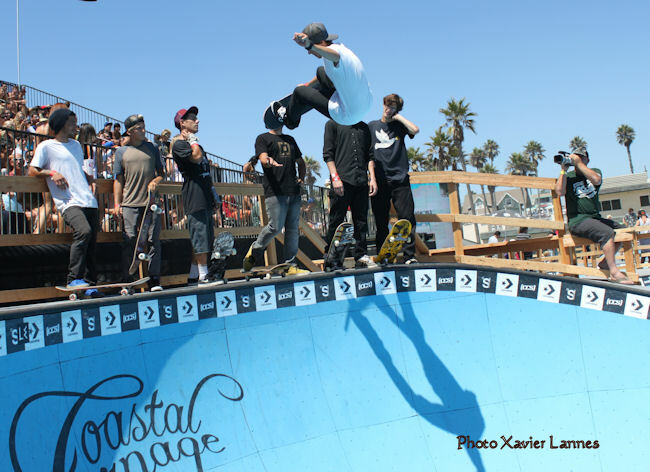 Coastal Carnage was supposed to be a battle of the giants: Tony Hawk and Christian Hosoi were one against the other at the Converse Coastal Carnage finals. Tony Hawk did not have to take part in the preliminary events but has been out on the Blue Bowl practicing and giving the crowd a bit of a show. Almost 20 years ago, Christian Hosoi emerged as one of the top competitors of vertical riding with an eventual rivalry developing with Tony Hawk with contrasting styles in both skateboarding and lifestyles—Hosoi, known for his flair and graceful style, and Hawk raising the bar with his technical ability and difficult tricks. This monumental face off will take place at the Converse Coastal Carnage Final competition. 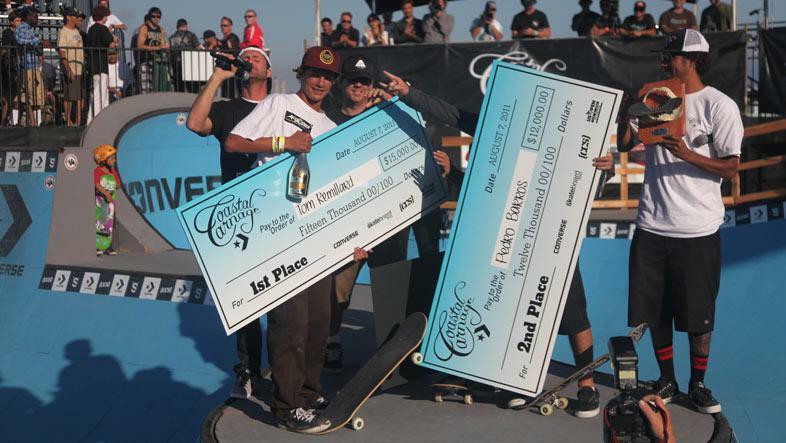 If this is Tony Hawk’s first participation to the contest, Christian Hosoi is not new to Coastal Carnage. Indeed, he landed #14 in 2009 and again #14 in 2010. Also competing in the finals: were Lance Mountain, Tom Remillard and Kalani David, Ben Hatchell, Robbie Russo, Curren Caples, Kevin Kowalski, Pedro Barros, Div Adams, Kyle Berard, Ben Raybourn, Josh Mattson and Andrew Langi. Thousands of spectators gathered along the14-acre stretch of sand on the south side of the Huntington Beach Pier over nine days of nonstop action from leading surf, skate and BMX pros, which culminated with the skate Finals on Sunday. But the much ballyhooed contest between Tony Hawk and Christian Hosoi did not really happen and whereas Tony Hawk; determined to be more than just a skate icon; won the Best Trick contest with a "McTwist" on the skark pillar, Christian Hosoi landed at the 13th place. 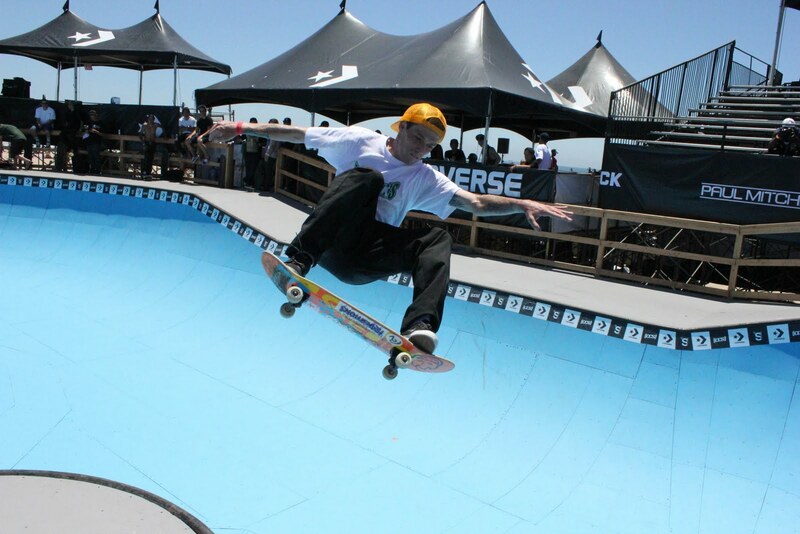 Eventually, Tony Hawk put his stamp on the competition with a fourth place finish, not bad for a skate Dad!!! It actually should come as no surprise to anyone who saw Tom Remillard grinding the Converse Coastal Carnage bowl over the past three days that the San Diego skater would be nearly impossible to beat and after three days of competition and ten qualifying rounds, Remillard took the top prize of $15,000. However, how he managed to beat Pedro Barros remains both a feat and a mystery... It definitely helped that, from the start Tom was portrayed as the winner of the Coastal Carnage contest by Cons (his mother sponsor). Tom finished #2 just after Ben Hatchell at the Coastal Carnage 2010. And for a guy who doesn't skate contest very often (that is the least to say) he sure seemed like a seasoned vet as he pulled numerous combinations of tricks on the vert cradle including a stalefish and a backside tailslide to fakie. His smooth, effortless flow at speed is unmatched on this terrain and is reverts out of the cradle and the deep end were just crazy. was a crowd favorite and even qualified second in Saturday's prelims. impossible for anyone to be insensible to his talents. He's already toured with some of the most influential skaters of all time (namely, on the Girl and Antihero Beauty and the Beast trips and on Cons filming missions for "Prevent This Tragedy"). Remillard has it all and he worked his knees to the bone to earn what he's got. Asked if he watches old skate video for inspiration he answers that he watches “old Antihero videos, Speed Freaks, old contest footage… The level of skating has gone up but the mentality has stayed the same. “ The worst injury he ever got? “I broke my wrist in half, that’s permanent damage that’s never going away.“ He is also featured in the 2011 Converse’s History in the Making ad campaign. Tom Remillard came out the well-deserved winner with close to a dozen tricks on the over vert cradle, including huge backside ollies, a stalefish and a backside tailslide to fakie. Pedro Barros and Curren Caples wound up in second and third, respectively, both flying around the bowl all weekend. Here’s how the rest of the skaters ended up on the final jams on the Blue Bowl of Coastal Carnage at Huntington Beach today. Tom Remillard. It was a hard contest to judge but in the end it was Remillard who came out the winner. 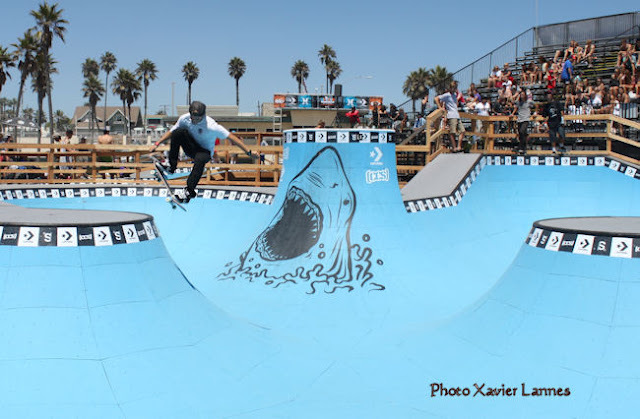 Converse Coastal Carnage, in its third year, is a pro/am skate competition consisting of 40 premier skateboarders taking place against the backdrop of the Nike US Open of Surfing – the world’s largest youth culture and action sports festival.